Are you eligible for the training? Social Sense is managing the roll out of a 3-tier Mindfulness Training Programme across across HeadStart Kent schools and settings. The Mindfulness programme is based on best practice and principles outlined in the Mindful Nation UK Report and to the standards set by the UK Mindfulness Network of Mindfulness Teachers. The resources which accompany the course are influenced by the evidence base for young people that has been researched by Professor Katherine Weare, an eminent lead academic in the development of Mindfulness for children and young people and an associate on HeadStart Kent’s expert panel of children and young people’s wellbeing specialists. The programme is funded by The Big Lottery, which enables teachers and practitioners to access funded training and resources and as such, we need to ensure engagement and ongoing commitment to create sustainable outcomes for children and young people supported by the programme. Mindfulness Awareness (Level 1) training is available to anyone with a curiosity about Mindfulness from those who have never used it before to those who have been introduced at a very basic level, or as a refresher for those who may not have practiced in a while. This introduction gives examples of techniques and is experiential for the learner with some presentation of key concepts. Please click here to book on to a Mindfulness Awareness (Level 1) course. 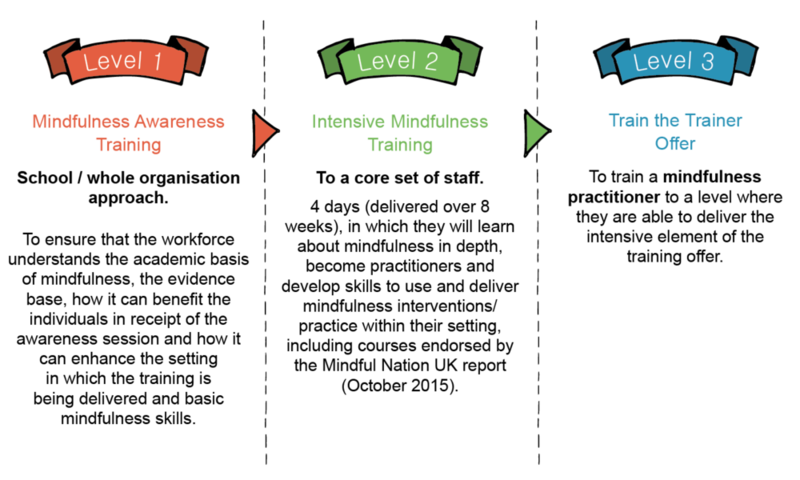 Interested participants will be assessed on their suitability to progress to both the Mindfulness Intensive (Level 2) and Mindfulness Train the Trainer (Level 3) stages using the Kirkpatrick Model, details of which can be found here. We will test the following 4 key areas. 1) Reaction – the degree to which participants see the relevance and usefulness of Mindfulness in their role with children and young people. 2) Learning – the degree to which participants learn and are confident in their personal and professional practice of Mindfulness. 3) Behaviour – the degree to which participants can demonstrate their application of what they have learned in Mindfulness, in their working context. 4) Results – the degree to which outcomes have been met as a result of the application and use of Mindfulness practice with children and young people. If you would like to submit an expression of interest for a Mindfulness Intensive (Level 2) (4 - day) course or Mindfulness Train the Trainer (Level 3) (2 - day) course, please click the links above. You will then proceed to the eligibility questionnaire. Please make sure you review the criteria on the page, as you will have to tick the box to say you have read and understood expectations and are willing to adhere and be accountable to the criteria when entering onto this course.